FLOWER MOUND, Texas, Sept. 16, 2015 — ProTom International (“ProTom”) is pleased to announce its accelerated focus on the installation of its Radiance 330® Proton Therapy System (“Radiance 330”) to be housed in the Massachusetts General Hospital (“MGH”) Department of Radiation Oncology. For the first time, advanced scanning-beam technology that’s more affordable than ever is being installed inside a radiation-shielded vault embedded within an existing, operational radiation oncology department — a solution that enables the facility to share clinical staff, ancillary equipment, and patient support areas. Beginning last Fall, modifications were made inside two empty linac vaults that were reserved for future expansion, preparing the space for the new proton therapy suite. Adapting the unique technology to the space and occupancy constraints of the operational clinical facility was made possible partially due to the lower neutron emissions of the compact synchrotron accelerator. A reduction in the footprint of the treatment room due to the smaller gantry, as well as the highly-efficient scanning proton beam have each helped reduce shielding costs in the facility. Stray radiation has a major impact on shielding requirements and facility design, and Radiance 330 has some of the lowest levels in the industry. On site, the equipment support and alignment components have been installed, and the pre-installation utility infrastructure has been completed and accepted. Nearby, at ProTom’s assembly and test facility, equipment assembly, integration, testing and optimization are underway in preparation for installation on site. The synchrotron has been assembled and tested for all energies up to and including 330 MeV. A new, custom-designed power supply has been factory tested and demonstrated to provide power to the synchrotron for acceleration of protons to energies of up to 330 MeV, ensuring that the system is “future-ready,” having already been prepped for proton radiography techniques. Radiance 330 is the only system that will be capable of proton imaging for all patients and all treatment sites, once the optional capability is released to production. ProTom is currently working on the Radiance 330’s interface with a new and unique, combined 2D/3D imaging and positioning system. 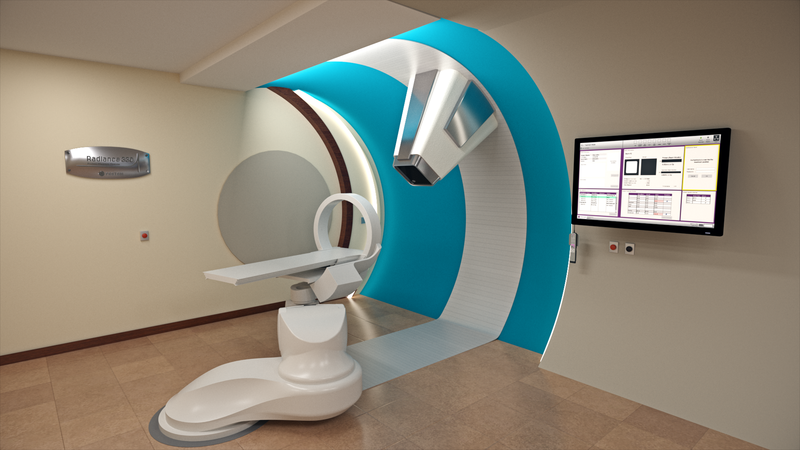 The system, selected by the hospital, features a cone beam CT image guidance ring atop a custom designed robotic patient positioner. The system will be controlled through Radiance 330 workflow management software for seamless automation of clinical operation. Over the past several months ProTom has commenced design of its own hand pendant for system control, which shall be honed to accommodate user input and MGH-specific – functionality. The pendant interfaces with ProTom’s software governing workflow management and motion control. ProTom’s proprietary Treatment Delivery Control System (TDCS) shall interface directly with MGH’s in-house information and workflow management software (Whiteboard). ProTom’s accelerated focus on the MGH project comes after successfully completing its restructuring and recapitalization as offered through the Chapter 11 process, and throughout the reorganization, MGH has sustained its full support to ProTom for successful project completion. The new MGH proton facility is expected to be completed and could begin treating patients in 2017. ProTom is a privately held company developing innovative solutions for proton beam radiation therapy. ProTom has offices in Flower Mound, Texas and Wakefield, Massachusetts. ProTom believes this proprietary technology will significantly lower the capital and operating costs of proton therapy centers and accelerate the adoption of this clinically-advanced treatment technology in the fight against cancer. Developing and delivering leading-edge proton therapy technology is not only what we do, it is all we do. Our medical device operations are headquartered in the USA — from which all of our design, manufacturing, and service divisions are currently managed and operated.